On 12 December 1971 in Paris, a group of doctors returning from the Biafra tragedy, together with a group of journalists, decided to set up a humanitarian organization that made medical care and bearing witness its core pillars. This organization is Médecins Sans Frontières. Nearly 50 years on, MSF is now the world’s largest independent medical-humanitarian organization. Email marketing is now a fundamental part of our digital strategy. We are able to achieve major goals in fundraising and communication. Thanks to MailUp platform’s advanced features, our email campaigns results are constantly improving. Médecins Sans Frontières Italy aims to respond to health emergencies and assist victims of conflicts, natural disasters, epidemics, or those who have no access to medical care. To achieve this, it relies on the generosity of citizens and companies whose contributions make up more than 99% of the funds raised. For this reason, the organization needed a channel that could personally engage donors and potential donors to express the story of the largest independent healthcare association, a story which is being written day in day out by around 30,000 operators in over 70 countries worldwide. segment recipients by grouping them into regular, occasional and potential donors, who are then subdivided by their personal interests and socio-demographic profile. 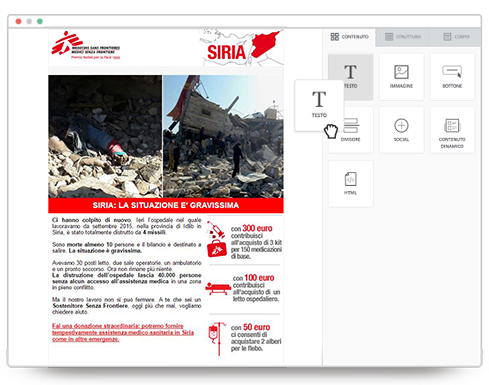 Spread the news and activities of MSF operators worldwide, using digital storytelling techniques with professionally designed emails optimized for mobile devices. Create various calls to action to diversify requests (single donation, sharing, sharing or content development), based on the communication being launched. Develop A/B testing to identify which elements of a campaign (subject, image and call to action) could obtain better opening rates and clicks. Médecins Sans Frontières’ new fund-raising campaigns have brought about successful results: the attrition rate (percentage of regular donors who have backed out) is on a downward trend, reaching -17%. Whereas, the upgrading rate has gone in the opposite direction, i.e. the number of regular donors who have increased their regular offerings is up by 18%. Likewise, one-off donations have increased by 14.19%. Divide donors into regular, occasional and sympathizers, to send targeted information tailored to the behavior of each contact. Track the performance of your campaigns, before and after delivery, thanks to A/B testing and detailed statistical reports. Configura los filtros de aperturas y clics, y envía campañas de recordatorio a los destinatarios menos sensibles a las comunicaciones anteriores.